To make a part payment or pay by phone, please contact your local Authorised Broker’s office. or to your local Authorised Broker’s office. You can pay your business insurance premiums by monthly instalments. Please contact your Authorised Broker for further information. 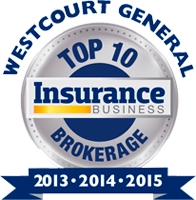 We are very happy to announce that Westcourt General Insurance Brokers has placed 3rd in the Insurance Business Top 10 Brokerages 2015. This year’s ranking is a welcomed progression from our placement of 4th in 2014 and 7th in 2013. Congratulations to all of our authorised brokers and hard working staff on this fantastic achievement.